Rotaract and Rotary make a Great Team! 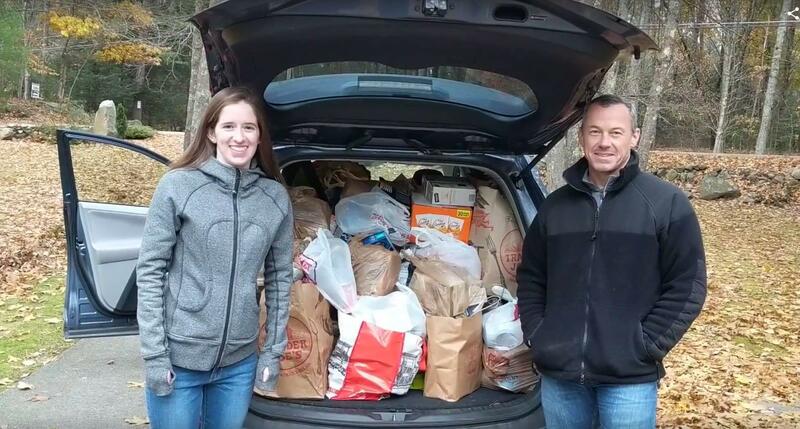 The UNH Rotaract Club and the Rotary Club of Durham-Great Bay recently worked together as a team to help provide an amazing amount of food supplies for the End 68 Hours of Hunger organization. End 68 Hours of Hunger aims to keep students and sometimes their families from feeling the pains of hunger from the time the school bell rings on Friday to opening bell on Monday morning. It is a great organization and one that the UNH Rotaract Club has been helping for a number of years. These last two years, our club has been honored to be a small part of the Trick or Treat for Hunger campaign that the UNH Rotaract students organize. A week prior to Trick or Treat night in Dover, the students leave information about End 68 Hours of Hunger and instructions for what and how to leave food donations at their doors or have ready when these same students return on trick or treat night to collect the donations. Cars and drivers on Halloween night provided by the Durham-Great Bay Rotary.